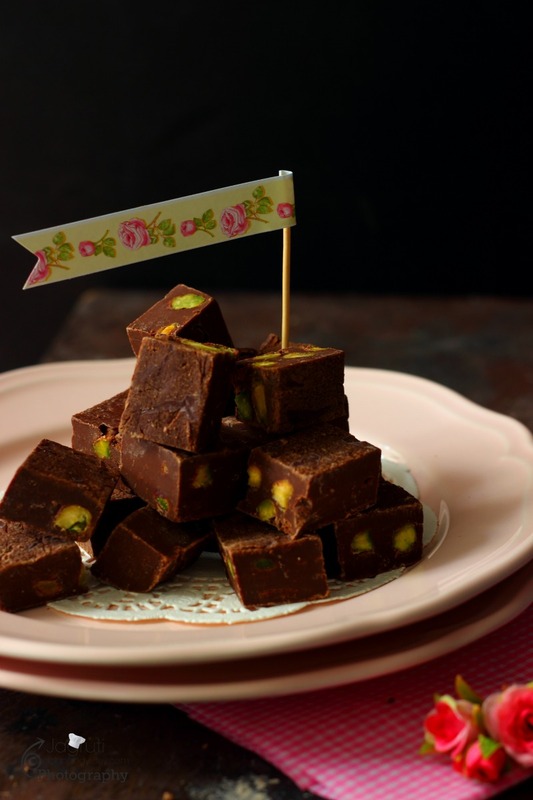 Dark Chocolate and Pistachio Fudge-these rich and decadent dark chocolate fudge studded with pistachios. The best part about this treat is that it is made with only 3 ingredients and comes together in 3 minutes, how cool is that? 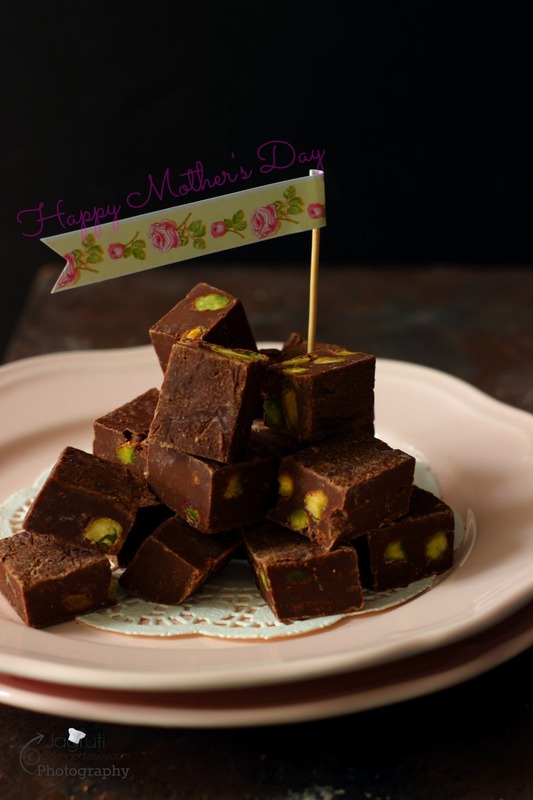 These must-try fudge would make a fantastic mother's day, father's day or Christmas gift or you can always prepare a small batch for yourself too! 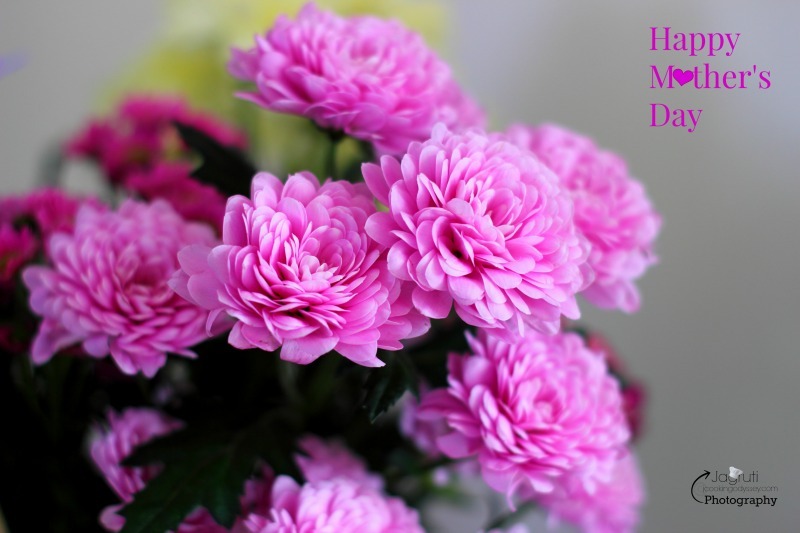 "If there was a day for everything you have given to me as a Mother, It would be a Mother's Day every day"
Do I Love Mother's Day? Koi Shak !! Actually, who doesn't? 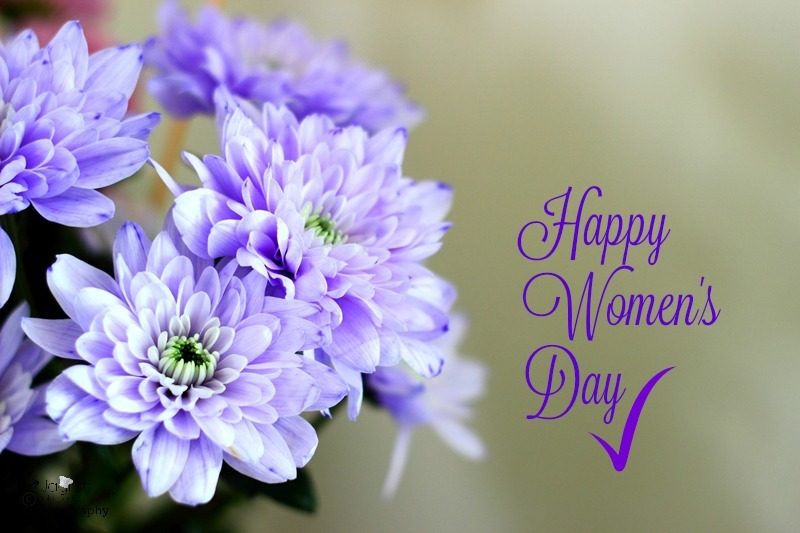 We, mums love to get spoilt by our precious angels, don't we !! Tell you the truth I am the lucky one, my two beautiful kids doesn't only make me feel special on Mother's day, but they never miss an opportunity to make me happy every day, what more can I ask for? It's so true that Mother's day should be embraced every day, you don't need to spend money or lots of time but just by giving that respect and care she deserves the most and by showing appreciation to let her know how wonderful she is !!! Awwww, did I make you emotional? My two lovely children now 22 and 20, and has enriched our lives in so many ways. Over the weekend I celebrated my 22nd Mother's day. 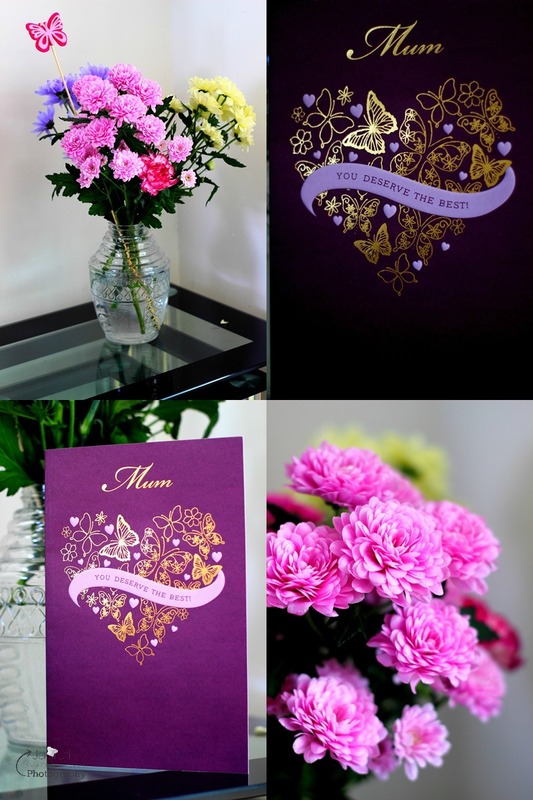 My Sunny boy brought a beautiful Mother's day card and I received a tight hug from him, and dear husband came with pretty and gorgeous flowers and Daughter could not make it the weekend, so she visited last weekend and we celebrated Mother's day and she got some thoughtful gifts for me. When you are a food blogger, your friends and family know what things make you happy, so daughter got me these two beautiful dusty pink plates ( see pics ) and Laptop support ( Lap desk ), so useful for me. I've already got used to this equipment and loving it as it is helping me so much. Although on actual Mother's day daughter was not with us, from far she was making sure that both boys make my day pleasurable day. For our lunch, she ordered Pizza on-line from her place and I received in London, how cool is that :) and for dinner sunny boy and husband treated me so well, what a fabulous day I had !!! 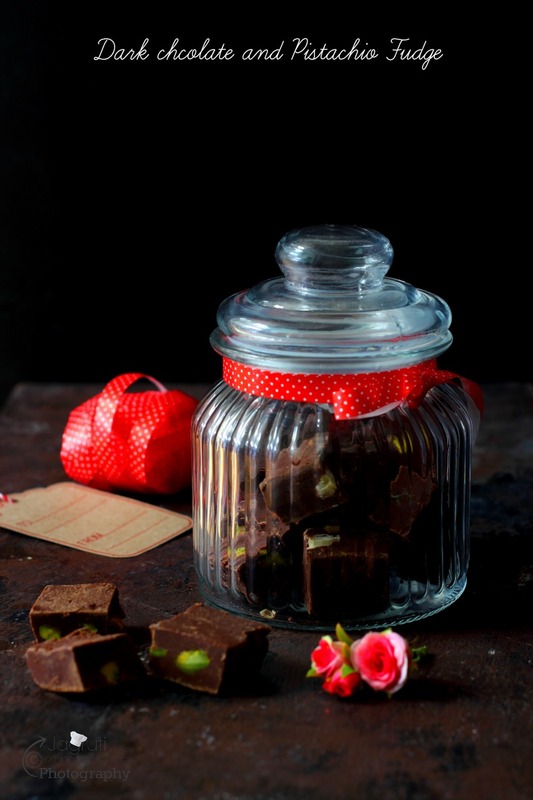 A jar full of Dark Chocolate and Pistachio Fudge was another thoughtful gift daughter got for me, not bought but handmade by her. She knows her mum so well :) These treasures will remain on this blog forever! 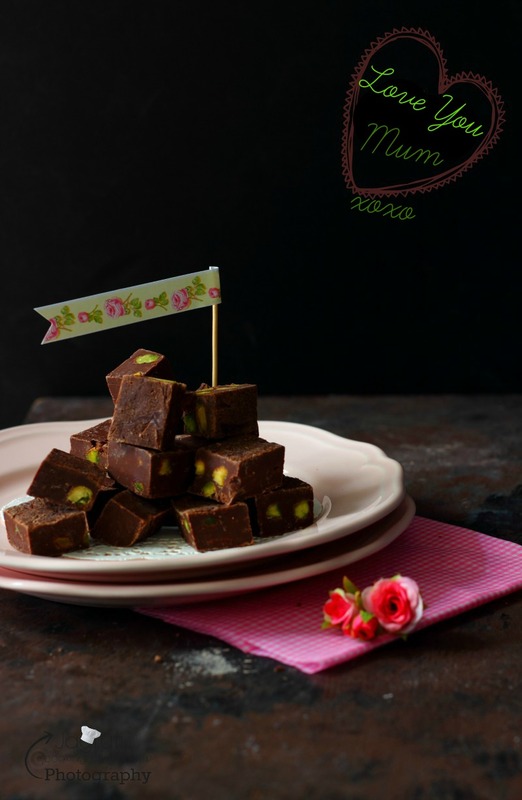 According to her, these cute fudge were the World's easiest fudge to make, All you need is only 3 ingredients and 3 minutes of your time, oh and too add some bonus point, it requires very little clean up afterwards! They are rich and creamy and tastes so amazing, It would make a great gift for your near and dear ones on any happy occasion. 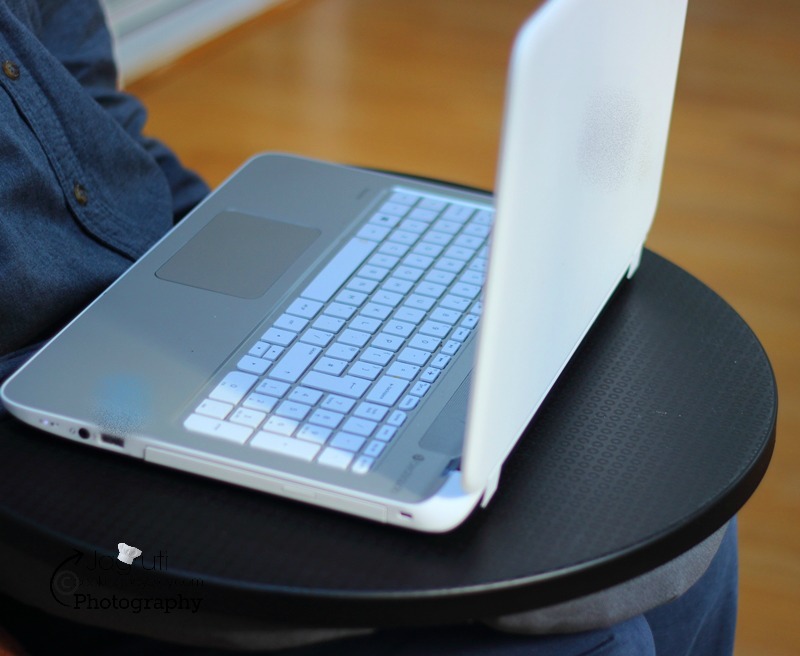 Line a tray or plate with foil. Place chocolate and condensed milk in M/W safe bowl. Microwave for one minute ( 60 seconds ) and stir well. Again Microwave for one minute and stir well. If chocolate is not melted completely, Microwave for another half a minute. Stir well and add pistachio nuts. 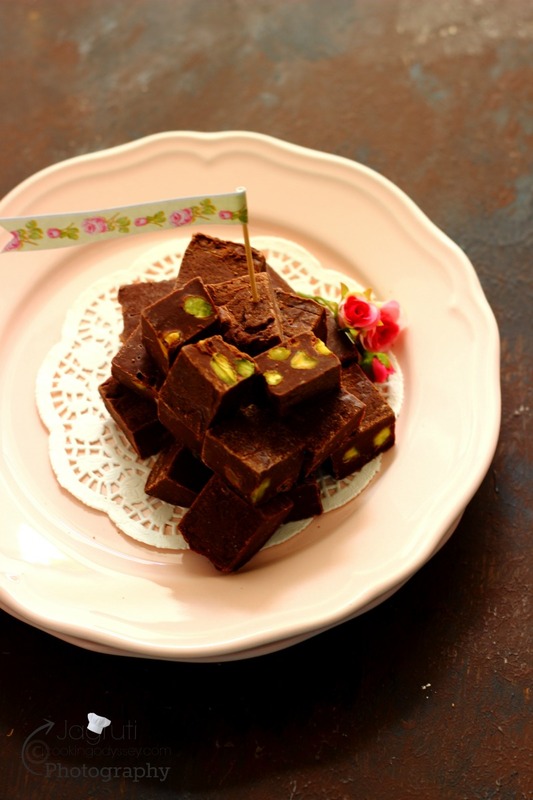 Pour fudge mixture in a tray. Let it sit for about an hour, so fudge gets harden. 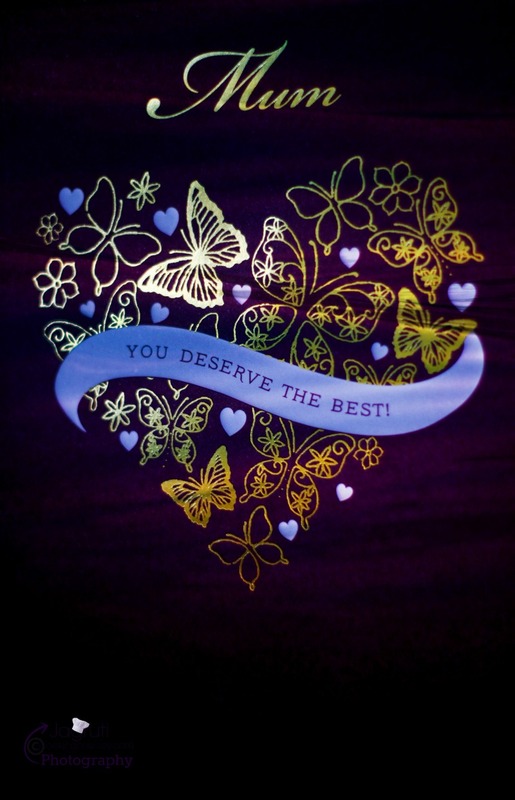 Store in an airtight container or arrange in a box and give it as a gift. You can use milk or white chocolate instead of dark. 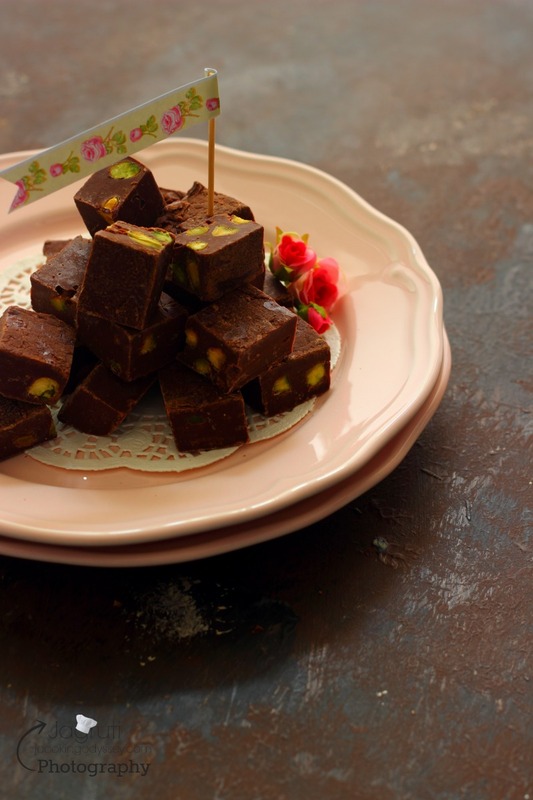 If you wish you can use any other nuts or dry fruits instead of pistachio nuts.